While the glory of Chinese and Islamic civilizations waned during late medieval times, another civilization was starting to flourish on the European edge of the Old World. Invigorated culturally by its synthesis of Christian religion with its rediscovered Hellenic-Roman roots, and economically by the fusion of the disparate resources of its precocious, semiarid Mediterranean south and its slower rising, colder, temperate north, Western civilization would consolidate an unprecedented 500-year supremacy over the world’s wealth and political order. An ongoing series of water challenges and responses marked the path of Europe’s historical ascent. Time and again, water’s inherent, latent potency as a transforming agent was unleashed by the conversion of a formidable water obstacle into a vehicle of productive expansion. Most dramatically, the West was propelled by two key turning points in history—the advent of transoceanic sailing with long-range cannonry in the European Voyages of Discovery in the late fifteenth and early sixteenth centuries, and the gradual harnessing of waterpower for industry, first with waterwheels and, in the late eighteenth century, with the invention of the modern steam engine. Also driving the West’s rise was the distinctive political economic order that arose in its most dynamic centers, featuring self-expansive, flourishing free markets and representative liberal democracies that sprung from the seeds originally planted by ancient Greece’s seafaring city-states. The European continent’s geographic shape as a peninsula bounded on three sides by high seas—the warm, lakelike Mediterranean Sea to the south; the cold, rough, semienclosed North and Baltic seas in the lonely north; and in the west, the vast, stormy, tide-tossed Atlantic Ocean, for most of history at once the West’s great impenetrable frontier and its protective barrier—fostered a natural maritime orientation central to its history. The continent’s absence of a unifying, arterial inland waterway like Egypt’s Nile or China’s Grand Canal further pushed Europe’s inhabitants toward its seascapes to communicate and trade among themselves. The Danube and Rhine rivers, which might have served as some part of that unifying backbone, flowed respectively east to the Black Sea and north toward the North Sea, both away from the main direction of early civilized European society in the Mediterranean; in fact the two great rivers had provided Rome’s primary defensive barrier against incursions from the nomadic barbarians who lived beyond it in the northeast—they were Rome’s Great Wall of China. Indeed, just as centralized, large hydraulic civilizations emerged along the arterial, irrigable rivers of some of antiquity’s semiarid habitats, Europe’s greater reliance on wide seas, rain-fed farming, and many small, navigable rivers helped foster its own distinctive political history of small, competing states linked by markets and friendly to the gradual development of liberal democracies. Backward northern Europe originally sprang to life during the so-called Dark Ages from about AD 600 to 1000 from a sparsely populated, barbarian hinterland of the old Roman Empire into a settled, autonomously growing region of Christian civilization with critical impetus from a combination of water engineering including new plow technology, land drainage that expanded its rain-fed cropland, and exploitation of its small rivers for navigation and waterpower. Following the Byzantine emperor Justinian’s failed bid in the sixth century to reconquer the Roman heartland, northern Europe on both sides of the Rhine and Danube underwent tumultuous centuries of power struggles among barbarians and settled societies from which ultimately emerged a decentralized feudal political system and manorial economy linked by independent walled towns and unregulated trade. The most important barbarian kingdom was that of the Franks, whose conversion to Christianity at the end of the fifth century and political alliance with the Roman papacy was crucial to the survival and spread of the Latin church. At their zenith under Charlemagne, who was crowned Holy Roman Emperor on Christmas Day 800 by Pope Leo III at St. Peter’s, the Rhine Valley–centered Frankish kingdoms controlled almost all of modern France and modern Germany, the upper Danube, and northern Italy. Yet in the ninth and tenth centuries, the stability of the Frankish and other consolidated administrations eroded under pressure from a new wave of barbarian raiders, including the terrifying Scandinavian Norsemen, or Vikings, who earned a living sailing up and down Europe’s rivers and coasts in their long, shallow ships by raiding and exacting tribute from settlements situated along the shores. Ultimately repelled by walled citadels and castles defended by mounted, armor-clad knights, these barbarians, too, settled down to civilized life, adopted Christianity and, like converted barbarians throughout history, invigorated their new religion with fresh zeal. The Norsemen who settled in Normandy became the Normans that conquered England in 1066 and soon thereafter provided the knights who seized Sicily from Muslim control and then led the first crusaders from 1096 to 1099 in taking Jerusalem and the Holy Land for Christendom. By about AD 1000 most of northern Europe had been Christianized, and market forces had gained enough momentum to help launch the early stages of the commercial revolution from 950 to 1350 that propelled the West’s early economic takeoff. Northern Europe had always possessed promising physical attributes for development. Thanks to the blessing of the warm, Atlantic Ocean Gulf Stream current from the Caribbean, its northwest was a temperate climate zone suitable for nearly year-round farming despite its subarctic latitudes. It was rich in freshwater and other natural resources, had copious rainfall, and almost endless, indented sea coastlines with many good, natural harbors for shipping and trade. It had the potential backbone of an extensive waterway transport network in its many long, navigable rivers, mostly flowing north, that reached much farther inland than the rivers of Mediterranean Europe. Yet throughout Roman times the region faced one insuperable water obstacle to agricultural expansion—excessive precipitation and poor natural drainage of its heavy, clay soils. Thick forest and swamps covered most of its flat, often-waterlogged plains. Tillage methods applied in the lighter, drier soils of the Mediterranean and Middle East, notably including the simple wooden, shallow, scratch plow pulled by an ox or pair of asses, were all but useless in the northern terrain. As a result, northern Europe’s rain-fed cropland was limited to the slash and burn methods of hillside patches where drainage was adequate and in the few other locations where soils were naturally more permeable and could be worked by laborious, small-scale farming methods. With agriculture perennially hovering around near-starvation levels, population in the region was low and life spans short. The seminal breakthrough of the agricultural revolution that stirred northern Europe’s economic awakening came with the heavy wheeled moldboard plow. Pulled by a team of four to eight oxen, the moldboard plow had deep, curved iron or iron-covered blades that turned over deep furrows and produced high dirt ridges unlocking the fertility of the heavy soils over a wide expanse. The key technical breakthrough besides the application of costly iron blades was the placement between the team and the plowshare of wheels, which acted as a fulcrum for applying greater pressure to the heavier plowshare and improved the machine’s mobility over uneven terrain. By the tenth century it was in widespread use everywhere across northern Europe. Northern Europe’s landscape was dramatically transformed. Forests were felled, swamplands were drained, and everywhere wilderness was converted to arable cropland. The intensification of water management wrought by the heavy moldboard plow extended the footprint of mankind’s intensively cultivated cropland to new climate zone and sustained one of history’s great expansions of farming on rain-fed lands. Agricultural production and productivity both soared, setting the basis for an agricultural revolution that reached its apex in the eleventh to thirteenth centuries. Notably drier and milder climate—1 to 2 degrees centigrade—in Europe from the mid-eighth to thirteenth centuries abetted the expansion. The proof of its great impact was a surge in European population, which more than doubled from AD 700 to 1200 to 60–70 million. Population density increased wherever the moldboard plow came into widespread use. The moldboard plow also acted as a major catalyst in the structural transformation of medieval economic society. Being a powerful, but costly implement, it encouraged the cultivation of larger fields, the collective sharing of scarce draft animals, and cooperative labor among farmers. Fences separating individually owned fields came down and the collectively managed land came to be governed by peasant village councils—an early form of representative democracy—that settled disputes and rendered executive decisions about total cropland management. These councils became essential features of northern Europe’s characteristic self-sufficient and self-contained village communities, or manors, which contrasted distinctively from the individualistic economic and social structures that prevailed in the scratch-plowing, drier lands south of the Loire River and the Alps. The heavy moldboard plow became the foundation of a new three-field triennial crop rotation system that originated in northern France in the ninth century and within three centuries was common throughout northwestern Europe. Wheat or rye was planted in one of three fields surrounding the village in the autumn; the second field was planted in the spring with oats, barley, or peas; the third was left fallow in order to replenish the fertility of the soil. Farming villages often encompassed the cultivated landholdings of free peasants as well as tenant-farmers working part of the lord’s manorial domain. The lord provided many general services, such as blacksmithing and the waterwheel-powered gristmill for grinding grain into flour to make the daily bread; tenant-farmers commonly were obligated to use the manorial mill for a standard one-thirteenth share of their grain or flour. The village-centric, manorial economy was integrated into the decentralized, governing feudal association of lords, vassals, knights, and peasants to constitute the signature political economic system of the era. The agriculture bounty and population growth unlocked from Europe’s waterlogged plains by the moldboard plow helped activate other of the region’s latent water assets to impel further economic expansion. After 1000, Europe’s long inland rivers and northern seacoasts came alive with merchant vessels, often heavily armed, transporting crops and raw material goods like timber, metals, wax, furs, wool, and eventually salted herring, among rising free commercial towns and seasonal trade fairs. On the northern seas, many of these early merchants were descendants of the longboat Norse raiders. 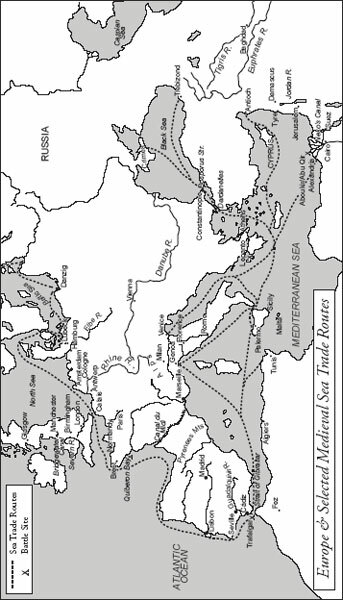 Major advances in the flat-bottomed cog from the eleventh century transformed the treacherous, lonely northern seas into active trade highways carrying bulk cargo with small crews of 20 or fewer. The new cog was a much larger, sturdier single-square sail vessel with a rounded bottom and an innovative central sternpost rudder that replaced the traditional long steering oar. Cargo carrying capacity of the largest cogs sextupled, reaching 300 tons by the late twelfth century. When lofty platforms for archers were added, the high-decked cog also proved to be an excellent warship. Armed convoys of cogs became the workhorse of an informal network of free German seaport cities that by the twelfth century had started to dominate sea commerce in the Baltic and North seas. Centered in Lübeck on the Baltic side of the neck of land dividing the two seas, the powerful German-centered Hansa commercial association (also known as the Hanseatic League), with its own governing membership, laws, and customs, eventually numbered almost 200 free-trading cities and towns. The Hansa domain stretched the breadth of the northern seacoast and, as inland river trade developed, up the Rhine as well. One late-joining Hansa member was Cologne, situated at the juncture of two Rhine waterways, one flowing upstream and the other downstream, and a major overland route. This intersection made Cologne Germany’s largest town, albeit with a modest 20,000 inhabitants, in the fifteenth century. Although always smaller in volume than its sea trade, northern Europe’s inland river commerce created an extensive, inexpensive waterway network that galvanized economic activity in much the same manner, although to a far-lesser degree, as the Grand Canal in China. Localities built and maintained flood levees and interconnecting transport canals. In the Low Countries of modern Holland and Belgium, where extensive cropland was reclaimed by drainage, some 85 percent of commercial traffic moved by water, abetted by the use of navigation weirs and, from the late fourteenth century, canal locks. Rivermen often poled their boats downstream on busy rivers, sometimes paying exorbitant tolls for the chains stretching across them to be lowered, much like modern auto tollgates on a highway. Urban hubs throbbing with new market activity rose to prominence starting in the eleventh and twelfth centuries. Wherever navigable waterways converged or where key river crossing or favorable harbors were established, influential urban commercial centers arose. The most vibrant cluster in northern Europe was in the Low Countries, where the navigable Rhine, Meuse, and Scheldt rivers flowed near one another. It included the ports of Ghent, the largest city with 50,000 inhabitants in the fourteenth century, Bruges, Antwerp, and later Amsterdam; other big centers included Lübeck, London, and Paris. This was mirrored in Mediterranean Europe by a cluster of large northern Italian city-states, above all Venice, Genoa, Milan, and Florence, with populations surpassing 100,000. Due to the overriding importance of water navigation, it was no accident that the central marketplaces of Europe’s Commercial Revolution developed literally on top of and alongside the bridges and quays of the leading medieval towns and city-states. Like towns, bridges underwent a major building boom from the eleventh to thirteenth centuries, often becoming each town’s pulsing central marketplace. Shops and houses located around the bridges enjoyed the further medieval privilege of having at hand a common drinking water and sewage disposal source in the river below. Crowded with shops and markets were the late twelfth-century Old London Bridge across the Thames, the Grand Pont across the Seine, also featuring 13 floating water mills moored below its arches where the river flowed fastest to produce fourteenth-century Paris’s daily bread flour, and the stone bridge that still crosses the Arno at Florence, the Ponte Vecchio. Many pioneering early bridges were built by monastic orders, including the famous, 20-arched, Pont d’Avignon across the notoriously flooding Rhone in southern France that was erected in the late twelfth century by the Frères Pontifes, (Brothers of the Bridge). As bridges became a practical amenity that enhanced town trade and commerce, civic authorities undertook the responsibility for building many of them. This helped revive the Roman practice of public infrastructure investment, which became a mainstay of the West’s liberal, democratizing marriage of convenience between governments and private markets. Few bridges were at the center of so much important medieval commerce as Venice’s Rialto Bridge, the lone crossing over the Grand Canal at the heart of the greatest Mediterranean sea trading power of the age. The first wooden Rialto Bridge was built in 1264, replacing an old pontoon crossing. Several wooden iterations later, the late sixteenth-century stone bridge was erected, crammed then as today with two arcades of noisy shops and businesses bustling along its banks. Bakers, butchers, fishmongers, fruit and vegetable sellers, acrobats and other entertainers, and even the infirm in their beds at the hospice were conspicuous daily sights. Upon closer look, the hierarchical skeleton structure of early market capitalism itself was physically visible beneath the manifold relationships of the merchants of Venice crowded around the Rialto: the small merchants haggling over price and exchanging goods for money on the bridge within earshot of the larger wholesale suppliers who bought, sold, and signed trade and shipping contracts every morning nearby in their loggia, or meeting room—an early commodities exchange—and who then later in the day walked a few paces to the narrow bank counter stalls of the banchieri—the “bankers”—who settled their transactions by book entry account fund transfers and reinvested the accumulated capital profits of the marketplace in a new circuit of loans and ownership stakes in fresh speculative ventures. Many modern financial practices began in this era, including the debit and credit and double-entry format of modern balance sheet accounting and, in the fourteenth century, the bill of exchange facilitating merchants’ ability to conduct business in distant locations. The era also inaugurated history’s notable sovereign loan defaults—by British monarchs to their Italian bankers—with the resultant bank collapses and international financial and economic crises. For centuries the two distinctive, rival economic realms of town commerce organized by market supply and demand on the one hand, and the immense, traditional manorial economy of barter and self-sufficient farming on the other, coexisted side by side with overlapping trade between them. Gradually, however, the more-productive market realm expanded faster and brought more and more of Europe’s economic resources under its ambit, eventually relegating the manorial realm to the margins, and then the annals, of history. Enough development had occurred before the disruptive, population-decimating famines and plagues of the fourteenth century that the outline of Europe’s signature model of market economies operating across a fragmented political environment was visibly emerging. The superior competitive dynamism of the town over the manorial realm in shaping Europe’s destiny was vividly illustrated by their contrasting uses of the waterwheel. On the manor, the waterwheel rarely transcended its traditional function for grinding grain into flour. Under the influence of commercial market forces centered in the towns, it was transformed into a primary agent of the Mechanical Revolution (eleventh to thirteenth centuries) that powered the takeoff of Europe’s early industries. The waterwheel’s invention in the first centuries before the Christian era ranked as one of the watershed moments in the history of civilization. In contrast to its older cousin, the ancient, animal-powered noria, or wheel of pots, that lifted water mainly to irrigate cropland, waterwheels fitted with paddles or blades turned automatically in ceaselessly flowing currents to transmit the captured water flow energy to do productive work. In effect, the waterwheel was history’s first mechanical engine. It provided mankind with its first great breakthrough in harnessing an inanimate force of nature since the domestication of fire at the dawn of humanity and sailing at history’s early beginnings. For some two millennia waterpower would represent the pinnacle of civilization’s constructive command of nature’s power. The simple horizontal waterwheel—in which water flow turned a wheel that lay parallel with the millstone affixed above it—was used the world over, chiefly to grind bread flour. It was several times more powerful than the ancient hand mill turned at about one-half horsepower by two slaves or a donkey. Horsepower was augmented by a factor of five to six times over the hand mill by the innovation of placing the wheel vertically in the water. The vertical undershot wheel transmitted its rotating power through a camshaft and gearing mechanisms to turn multiple millstones or other devices at higher speeds of rotation, even though its reliability varied with fluctuating stream and weather conditions, such as droughts, floods, and freezes. Another major improvement—which became crucial to launching Europe’s early industrial development in the late Middle Ages—was an overshot version of the vertical waterwheel. By directing a steady flow of water to fall onto the wheel blades from above, often through a millrace emanating from an artificial pond or a dammed river and regulated by a sluice gate, the vertical overshot wheel typically was three to five times more efficient than its undershot cousin and also permitted larger, more-powerful wheels to be employed. Leonardo da Vinci, who worked brilliantly on many problems of water hydraulics including canal locks, water pumps, bridges, and paddleboats as well as waterwheels, was among the earliest to argue, rightly, that the overshot wheel was the most efficient design some 250 years before engineers were able to prove why. A few exceptional overshot wheels in medieval Europe were capable of as much as 40 to 60 horsepower. Coastal regions from Venice to Brittany and Dover even experimented with ocean-tide-powered mills, although these always remained on the periphery of mainstream waterpower history. Although ubiquitous, waterwheels until the eleventh century were commonly weak in individual horsepower and rarely used for industrial applications. The Domesday Book (1086), compiled by Britain’s new Norman rulers to assess what potentially taxable assets they’d won in their conquest of 1066, recorded that south of the Severn and Trent rivers there were no less than 5,624 mills serving 3,000 settlements—or nearly two water mills per settlement. The ratio was likely similar on the even more prosperous and heavily populated Continent. Mills were widespread enough to have been taxed by Charlemagne at the start of the ninth century. Damming rivers to power waterwheels is recorded in the annals of French history from the twelfth century, with one account describing how a king hastened the surrender of a town he was besieging by breaking the dams that powered its mills. In the early fourteenth century, the Seine near Paris had 68 mills concentrated within less than one mile. Floating mills were common sights under the bridges of major cities. Virtually every suitable little stream in inhabited regions had several flour mills, often situated every quarter to half mile apart. By the debut of the eighteenth-century Industrial Revolution, Europe likely had over half a million water mills, whose enormous combined horsepower provided an indicative proxy for the advanced stage of material civilization attained in the West. The waterwheel’s greatest impact on world history was in Europe because it was there that it was most extensively applied to early industry, especially after the eleventh century. The waterwheel inspired experimentation by craftsmen with a panoply of mechanical gears, flywheels, camshafts, conveyor belts, pulleys, shifters, and pistons that seeded the foundational know-how of industrial production. The surprising technological pioneers of applying waterpower to industry were religious monasteries. Ever since St. Benedict foreswore his solitary hermit’s existence and instituted the Benedictine Rule for the monastic community he established in AD 529 at Monte Cassino in southern Italy, European monks had been actively engaged in physical labor as a material and spiritual boon to their communities’ purpose. Self-sufficient monastic communities played a key role in early medieval civilization by preserving ancient books and rekindling classical learning, converting pagans to Christianity and less famously, advancing and disseminating many hydraulic arts, including dike building and maintenance, swamp drainage, and bridge building, as well as the application of waterpower to myriad monastic activities. The most ambitious monastic pioneers of waterwheel technology were the rapidly expanding Cistercians, founded in the late eleventh century, whose monasteries were consciously built near rivers to exploit its waterpower and which often housed large factories. Few individuals in history put waterpower to better use than the celebrated mystic Cistercian leader St. Bernard at his twelfth-century Clairvaux Abbey, in a valley in northeastern France. Water was drawn to the abbey from a two-mile-long millrace fed by the river Aube. Paraphrasing the description of a contemporary observer, the water first rushed to the corn mill where the wheels turned millstones to grind the grain and shake large sieves to separate the bran and the flour. In the next building, the water filled the boiler used for brewing and then drove the heavy hammers that beat the fulling cloth. After the tannery it was routed into many smaller courses, where it was employed in sawing wood, crushing olives, and providing running water for cooking, washing, bathing, and ultimately carrying away all refuse. In the twelfth and thirteenth centuries, Cistercians pioneered the breakthrough application of water-power to iron foundries in England, France, Denmark, and Italy and were among Europe’s leading iron producers for several centuries. As waterwheel know-how migrated from the monasteries to Europe’s growing commercial towns, it was employed for market-driven industrial applications. Waterpower propelled mechanized sawmills, bore wood and metals, and helped pound beer mash. In mining it was employed to crush metals, power shaft ventilation machines, and raise winches that removed buckets of mine water and excavated ores to the surface. But it was in the seminal industries of papermaking, textiles, and iron forging that waterwheel-power technology stood out as having the most dramatic impact on Europe’s economic rise. Paper mills with giant, water-powered beaters that pounded pulp migrated from Baghdad to Damascus by 1000 and to Muslim Spain by 1151. Christian Europe’s first water-powered paper mill was opened in 1276 in Fabriano, Italy, where the watermark was shortly thereafter pioneered. Since papermaking required vast amounts of clean water as an input in the production process, most paper mills were located upstream of the nearby towns that might pollute it. Mass production reduced the cost of paper, stimulating the nascent commercial bookmaking industry that evolved from the monasteries in the twelfth century and the thriving centers of Islamic civilization. This paved the way for the landmark fifteenth-century invention of the printing press, which in turn helped democratize European society and reinforce the foundations of Western humanism and science through the dissemination of books and knowledge to a wider public—the original information revolution. Clothing textiles also had a special place in European history. Textiles were one of the earliest major industries to go international, linking raw material suppliers and intermediary and finished goods producers in a web of market activity that stretched from England to northern and Mediterranean Europe. Waterwheel mechanization powered the beaters used by cloth fullers and, when the Chinese silk loom reached the West in the thirteenth century, to drive silk-spinning machines. By the fourteenth century, one silk mill in Lucca, Italy, employed an undershot waterwheel to drive 480 spindles. Eventually, the water-powered spinning of cotton and other low-priced textiles in eighteenth-century England accompanied world history’s first fully mechanized factories, the earliest signature hallmark of the Industrial Revolution. The waterwheel played a decisive role in medieval Europe’s catalytic discovery of the blast furnace to smelt iron. Religious demand in the twelfth century for huge iron church bells may have provided the early impetus for the breakthrough. In the ensuing centuries, Europe’s iron foundries relocated from wood-abundant forests to riversides and fast-running stream banks to tap the continent’s waterpower. Waterwheels gradually supplanted the force of the smithie’s arm in pounding the iron by delivering uniform strokes of giant, 1,000- to 3,500-pound trip hammers and lighter ones of 150 pounds that tapped iron into shapes with 200 strokes per minute. By the late fourteenth century, waterwheels were widely used to blast powerful drafts of air through pairs of enormous leather bellows, several feet in diameter, to heat furnaces that could run nonstop for weeks on end at up to 1,500 degrees centigrade. Iron ore heated by these stronger blasts was liquefied, enabling for the first time in Europe the casting of abundant volumes of molten iron. In short order, the water-powered blast furnace transformed iron making from a traditional, small-batch handicraft into one of Europe’s earliest mass production industries. By 1500, iron production in Europe reached 60,000 tons. Soaring demand for iron nails, one of history’s humblest but most useful inventions, inspired a new water-powered rolling mill in which two iron cylinders flattened iron into bars that were then mechanically cut into nails by rotary disks. At the forges, mechanical trip-hammers attached to a wooden shaft pounded large volumes of malleable fired iron into various shapes that became farm and industrial tools. Iron’s marriage with the contemporaneous spread of gunpowder to fabricate firearms and cannonry, meanwhile, armed Europe’s vessels and soldiers with the advanced weaponry it would use so devastatingly to subdue societies around the world. Although comparatively backward in most other technologies and economic development, Europe by about 1150 was applying waterwheel-transmitted power to early industries on parity with the advanced civilizations of China and Islam. One of history’s puzzling questions was why only in Europe this budding mechanical prowess continued to develop into the direct precursor of the eighteenth-century Industrial Revolution. Islam’s failure can be explained partly by the fact that its dearth of small, year-round streams imposed upon it too great a deficiency of waterpower and internal waterway transport, and hitched its historical trajectory intractably to the plodding, overland trade network of the camel. One of China’s principal hindrances was its surfeit of cheap labor, which rendered mechanical innovation less urgent, and even potentially threatening to the established social and political order as well if it reduced employment. The Grand Canal transportation network’s enabling of the state to assert stronger internal command over the economy also generally blunted the innovating impetus of private market forces. Whatever the causes, the net effect was that China’s vaunted technical and scientific know-how was never rigorously applied to industrial production. Unlike hydraulic despots, Europe’s medieval kings could not furnish or withhold water from the fields. The rains fell regardless of what the king in his castle decreed, and there was nothing in the productive process to necessitate the organization of vast armies of workers…And so the feudal aristocracy was able to resist all attempts to establish genuinely national systems of government. Without control over water resources, no authoritarian, centralized state could rule firmly over a great area, leaving a wider berth for independent, cooperative manorial villages and competitive market-centric towns to shape the political economic norms of society. In Roman times slavery had retarded the incentive for labor saving innovation; by the Middle Ages slavery had all but disappeared and cheap labor was scarce. The profit-seeking logic of market forces applied Europe’s waterpower potential to mechanized technologies to overcome labor scarcity. Further accelerated by the competition between states, it drove European commerce and industry toward innovations that, in the end, could not be restrained by centralized command. The way was paved for developments that would eventually help drive Europe’s economic rise. First, however, the commercial and mechanical revolutions between 950 and 1350 spurred market-driven exchanges between northern and Mediterranean Europe that gradually linked the two regions into an integrated economic area. Initially, the central axis of trade between north and south was overland and concentrated on a series of seasonal fairs, which attracted merchants from all over Europe, who negotiated trade contracts based on sample goods displayed at the fair. From the late twelfth to early fourteenth centuries, the largest were six fairs held in rotation nearly year round in the Champagne region of northeastern France, astride the main roads and waterways running from the Mediterranean Sea to the North Sea, and from the Baltic to the English Channel. Yet the Champagne fairs rapidly declined in the early thirteenth century as soon as a much cheaper, faster and more reliable alternative became available—the opening of a direct Atlantic coast sea route between the Mediterranean and the north. It was this private commerce-driven, Atlantic seacoast trade route that bonded Europe’s two disparate environmental zones together into a dynamic, unified marketplace that ignited Europe’s rapid takeoff and the ascension of Western civilization. The first of what would become the famous Flanders Fleet set sail from Genoa to Bruges in 1297. By 1315 regular convoys were traveling to the North Sea from Venice and Genoa. For 235 years to 1532, the Flanders Fleet sailed between Italy and the Low Countries, twin hubs of the European economy until the eighteenth century when the center moved decisively to England. In its cargo holds it transported bulky commodities of wool, raw materials, and salted herring, as well as some luxuries and spices from the Orient. One key event in the rise of the Atlantic coast trade was the breaking of the Muslim grip over the Strait of Gibraltar. Throughout history, control of the eight-mile-wide strait had been a source of power and wealth. For centuries from antiquity, the strait known to the Romans as the Pillars of Hercules had been firmly controlled by the long-vanished city-state of mysterious origin, Tartessus. Located outside the Pillars at the mouth of Spain’s Guadalquivir River, Tartessus flourished as an emporium for locally mined silver and lead and precious tin for making bronze that was imported from as far away as Brittany and Cornwall. Despite founding a trading colony close by to the east at Gades, modern Cádiz, the Phoenicians could not challenge Tartessus’ Atlantic monopoly. Finally, around 500 BC, soon after Tartessus disappeared from history, the Phoenicians of rising Carthage sent an expedition under a captain named Himlico into the North Atlantic along the old Tartessian trade routes. Thereafter, for over two centuries, Carthage was master of the strait and the rich trade monopoly it conferred. With Carthage’s defeat in the Punic Wars, Rome took control of the Pillars. It helped secure Rome’s empire through sea power control of the mouths of the major western and northwestern European rivers and supported Emperor Augustus’ sending of fleets as far as the coasts of the North Sea in his unsuccessful effort to extend Rome’s frontiers from the Rhine to the Elbe. The next great civilization to profit from the long-held monopoly over the Strait of Gibraltar was Islam through its control of the land on both sides in Spain and Morocco. The European breakthrough at the strategic strait was accomplished in 1291, when Benedetto Zaccaria of Genoa destroyed the Moroccan fleet that defended it. Zaccaria was a colorful figure, whose exploits embodied the animating spirit of Europe’s early rise. Marco Polo of Genoa’s archrival Venice was his contemporary; indeed, Polo was imprisoned in Genoa dictating his tales of the Silk Roads and the Orient while Zaccaria was living outsized adventures influential in European history. Over the course of Zaccaria’s eclectic career—which included being a pirate in the Aegean, mercenary naval commander for several states, diplomat, crusader in Syria, ruler over a Greek island, governor of a Spanish seaport, and Europe’s most powerful alum baron—his many ships put in at almost every important seaport from Flanders to the Crimea in the Black Sea. Zaccaria was a member of the upper merchant class of the Genoese republic, which had arisen as a great Mediterranean power from the late eleventh century after it and other city-states from Italy’s western coast, including Pisa and Amalfi, had united to drive out piratical Muslim sea raiders from their waters. As a youthful trader in the international wool, cloth, and color dye business, Zaccaria in 1274 had seized the opportunity to exchange naval assistance to the Byzantine Empire for the right to develop a huge, virgin, extremely high-grade deposit of alunite he had surveyed in Asia Minor. When processed, alunite provided the basis for alum. Alum was widely used in medieval times, most importantly as a color fastener in dyeing textiles and as a hardener in tanning. Because colors fastened best with the highest-grade alums, alum quality was a key determinant of the order of economic supremacy among the competing dye centers of Italy, Flanders, and England. Because alum’s great bulkiness made it expensive to transport overland, comparative advantage accrued to states on the sea routes of the Mediterranean, where the era’s best deposits were located. One other Asia Minor quarry had alunite deposits of superior grade to Zaccaria’s; through political maneuvering, Zaccaria was able to get its exportation rights temporarily blocked—until he himself succeeded in securing an ownership interest in it. Zaccaria’s huge alum refining operation featured giant processing vats that were protected on land by a fortress and at sea by cruising ships. Armed soldiers helped ensure the safe transport of the alum cargo ships once the convoys put out to sea for the textile markets. As he sought the best market price, Zaccaria was inevitably drawn northward. One of his ships got through Gibraltar and reached England as early as 1278. Ultimately, the lure of lucre drew him toward his showdown victory over the Islamic Moroccan fleet at Gibraltar in 1291 that opened the Atlantic coast to unimpeded European shipping. A naval warrior and would-be crusader to the last, Zaccaria died in 1307 or 1308, bequeathing his heirs one of medieval Europe’s earliest and largest private commodity empires. Despite the Genoese’s pioneering, it was archrival Venice that ultimately profited most from the Flanders-Mediterranean sea trade. From the redoubt of its island-flecked lagoon on the upper Adriatic Sea, the Venetian republic had been one of the earliest Italian city-states to lead the revival of Mediterranean Europe from the tenth century. From its earliest roots, Venice was wedded to the sea; indeed, a great festival symbolically commemorating this marriage was consummated anew each year with the tossing of a ring into the waters. From the fifth century, when Roman citizens from the countryside fled the invading barbarians for the protection of its mucky marshes and islands, Venice’s fate had hinged on its response to one of urban society’s most water challenged environments. With no agriculture and sinking soils, its flat, muddy, and often waterlogged islands had to be constantly drained, built up with soil dredged from its lagoon beds, and protected from the sea tides by laboriously constructed artificial barriers. Malaria and the diseases of miasmic swamps abounded. Indeed, when Dante Alighieri’s special embassy in 1321 regarding navigation rights on the Po River was unfavorably received by Venetian leaders, the great author of The Divine Comedy and professional diplomat was forced to return to Ravenna via malarial swamplands, from which he took fever and died. With scant natural resources save fish and the salt of its lagoons, Venice depended from the start on commerce and sea power. By the sixth century, its flat-bottomed trading barges crawled along the rivers of northern and central Italy. In the ninth century, it ventured forth into the Muslim-dominated Mediterranean under the protective shield of the largest and wealthiest city in Christendom, Constantinople. By the tenth century, it began to emerge as a thriving sea trading power in its own right. Its ships sailed among the ports of the Mediterranean, Europe, and the Levant, exchanging Eastern luxuries like spices, silks, and ivory that arrived by sea and camel train from Islamic Alexandria for bulky Western commodities like iron, timber, naval supplies, and slaves, as well as Venetian salt and glass. As an entirely maritime, merchant-oriented republic, Venice resuscitated the democratic, free-market traditions of ancient Athens. Yet in the favorable environment of commercially awakening medieval Europe, these Greek traditions took deeper root and flourished. They also were transplanted to other parts of Europe. Venice itself became history’s longest-enduring republic—1,100 years—and one of important progenitors of modern capitalism. Its devotion was to the pursuit of profit and commerce; more than once its leaders, who actively participated in speculative ventures, defied the Latin Church, even accepting excommunication, rather than obey a papal directive that crossed its vital commercial interests. By 1082 Venice had attained parity with Constantinople as a Mediterranean power. In that year its merchants became exempted from Byzantine tolls and received other special trade privileges when Venice agreed to provide naval help against the regional invasions of the Normans. By 1203–1204 it became master of the Mediterranean when, through astonishing cunning, calculated risk, and bravery of arms, its blind, octogenarian elected doge, Enrico Dandolo, diverted the Norman armies of the Fourth Crusade from their original target of Egypt and, against the pope’s wishes, induced them to successfully besiege and sack Constantinople as repayment for Venice’s furnishing of the crusaders’ fleet. The Venetians succeeded where the Muslim besiegers 400 years earlier had not by capturing the Golden Horn. Its soldiers seized control of the huge windlass used to raise and lower the great iron chain across the Horn’s mouth that regulated entry. Then, led by the charging Dandolo, and his banner of St. Mark, the Venetians from one side and the Normans from the others breached the walls for the first time since Emperor Constantine had founded the city nearly 900 years earlier—250 years before it would fall out of Christian hands to the Turks. Following several months of political intrigue, and a final siege and customary three-day sacking of Constantinople, Enrico Dandolo, by treaty with the Norman crusaders, took the best parts of the Byzantine Empire for Venice. Venice got three-eighths of Constantinople, including prime frontage on the Golden Horn, free-trade rights throughout the Byzantine Empire, from which its archrivals Genoa and Pisa were to be banned, and a choice string of ports stretching all the way from Venice to the Black Sea. Thus Venice was the clear winner of the Fourth Crusade, which in the end never fulfilled its purpose of assaulting Egypt or the Holy Land. Christian Europe’s new control of the Mediterranean, the rise of shipping in the northern seas, and the linking of the two regions through the Strait of Gibraltar helped stimulate a series of breakthroughs in naval architecture, navigation, and rigging that transformed European shipping from the early fourteenth century. The advent of sturdy, maneuverable, large, oarless sailing ships created vessels that, for the first time, could carry their cargo year-round in all weather. They became the direct progenitors of the world-changing transoceanic Voyages of Discovery at the end of the fifteenth century. The adoption of the magnetic compass from China facilitated sailing in the thirteenth-century Mediterranean, which was too deep for navigation by feeling the way along the bottom as was common practice in the northern seas. From about 1280 to 1330, rigging and ship design underwent a fundamental advance. Two important ship designs emerged. Venetian shipyards began producing a large sailing ship with two, and later three, masts, and rigged with triangular, lateen sails that made it highly maneuverable against headwinds. Although the ship had oars like a traditional galley, they were used only to enter and leave port. Even larger and sturdier from about 1300 was a new model northern sea cog. Clinker-built with overlapping planks and a central sternpost rudder, the cog ultimately became the workhorse of the Atlantic coast trade. To overcome the cog’s clumsy maneuverability in the Mediterranean and its problem exiting against the westerlies that prevailed at the Strait of Gibraltar due to its possessing a single square sail, the cog was enhanced with a second, or mizzen, mast rigged with a lateen sail. The Genoese, in particular, adopted this new model cog. They increased the size of its hulls so that by 1400 it could carry cargoes of alum and other bulk commodities up to 600 tons, or two to three times more than the competitive carriers of the northern Hanseatic League. The new vessels, which debuted in the Mediterranean, had much smaller crews and relied upon crossbows for defense against the ramming and boarding tactics of traditional oared galleys. The combination of new ship design and improved navigation helped trigger a quantum leap in Mediterranean shipping volume and velocity—Italian round-trips made to the ports of Egypt, the Levant, and Asia Minor doubled from one to two per year. Instead of being forced to winter in foreign ports as had been customary for centuries, Italian fleets left for the eastern Mediterranean in February and returned in May, reloaded their holds, and departed again in early August for a Christmas return. All-weather shipping spread to the Atlantic and to the northern seas. For the first time, a coherent, price-integrated commercial network of markets served by Zaccaria’s alum ships, the Flanders Fleets, and others emerged along Europe’s three sea coastlines from the Baltic to the Black Sea. The enormous economic impetus helped European growth survive the multiple catastrophic setbacks of the mid-fourteenth century—colder climates, famines, peasant revolts, and finally the Black Death—which annihilated one-fourth to one-third of Europe’s inhabitants. Europe’s population did not return to its pre-bubonic-plague level until after 1480. Integration by sea transport recalibrated competitive market conditions throughout the region. Baltic populations suddenly were able to preserve herring and cabbage throughout the winter with salt imported from southern Europe. Salted herring became a major export to the Mediterranean. When the Baltic herring, in one of the great ecological mysteries of history, migrated in the fifteenth century to the North Sea and within reach of Dutch fishing nets, it contributed to the concentration of commercial power in the north in the Netherlands. Another of the many natural changes that altered the course of history occurred when Bruges’s harbor silted up around 1500, diverting the Atlantic coast fleets to nearby Antwerp, which happily took over as the northern center of the north-south trade. But all that paled in historical significance beside the momentous water breakthrough that lay on Europe’s immediate horizon.